I took two weeks off from writing about my picks because I’ve been lazy busy, but I’m back with another week of picks. Enjoy the picks, or just scroll down to the Donald Trump part. I find it pretty funny that Kiko Alonso and LeSean McCoy are both already hurt. Pretty reminiscent of the Michael Pineda-Jesus Montero trade from yesteryear for you baseball nerds. Adrian Peterson’s newest son is named Axyl, which is not okay. I will, however, stick by him if I’m getting nearly a touchdown against an aging Peyton Manning. This Jimmy Graham-Max Unger deal seems like a real loser for everyone. A depleted offensive in Seattle has slowed down Marshawn Lynch, and Russell Wilson hasn’t used Graham nearly as much as Drew Brees went to him. Meanwhile Unger is wasting away on a bad Saints team. What is Mike Pettine’s end game playing Josh McCown over Johnny Manziel? McCown has proven over and over that he’s just not a good quarterback, and we’ve seen flashes of how great Johnny Football can be. At least have fun while you’re stuck in Cleveland, Mike. Personally, I’m very excited to see Michael Vick play on this Steelers’ offense. Le’Veon Bell, Antonio Brown, and Martavis Bryant are pretty similar weapons to LeSean McCoy, DeSean Jackson, and Jeremy Maclin that he had in 2010 across the state in Philadelphia. Between Ryan Mallett and Brian Hoyer, don’t you think the Patriots would have held on to one of them if they thought either had potential to be a starter down the road? When your fantasy teams are going poorly, the only solace you can take is players you thought were overrated doing poorly. I did not think C.J. Anderson and Jeremy Hill belonged in the first two rounds, and they’re proving me right so far. Also my two teams are a combined 1-5. The NFL’s flex schedule late in the season is made so, for instance, two potentially interesting teams lose their Pro Bowl quarterbacks and you get stuck with a bad game. Enjoy Luke McCown and Brandon Weeden, NBC! Thank God we sent our Who Cares? Game of the Week overseas to London. 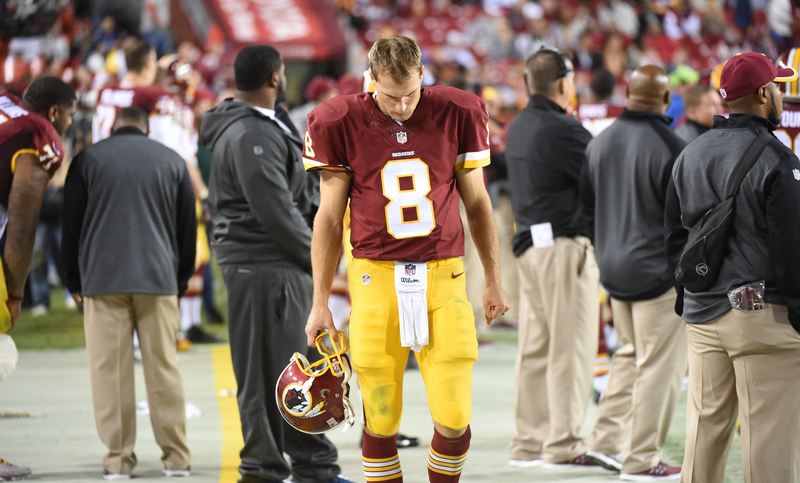 Can we stop pretending that Kirk Cousins has potential to be a good quarterback? Dude is already 27 and has thrown more interceptions than touchdowns. For anyone who wants to rain on the (really sad) Kirk Cousins parade, Hurricane Joaquin may hit the East Coast right around game time Sunday. That should be fun. The Panthers are going to start 4-0 and get two weeks to prepare for Seattle on the road. I thought their schedule was a joke until I looked at Atlanta’s, and man, their hardest game of the season may be at Carolina. Wow. I don’t know if this is more of a statement about how bad (Jimmy Clausen and) the Bears are or how much improved the Raiders are. It still blows my mind that Tyrann Mathieu fell to the third round of the NFL draft. Sure, he’s had drug problems, but the man is a playmaker and should’ve been swiped up in the second round at least by someone. I was personally shocked the Patriots didn’t draft him with one of their two second rounders, since they have a knack for taking players whose stock has fallen because of drugs (Brandon Spikes and Aaron Hernandez). How this line is not double digits is beyond me. People must still be stuck on how good this game would have been a year or two ago. Thanks for sharing the article. I especially liked the MLB video clip of AZ girls taking selfies over and over. Good reason you posted that #1.